KFD Premium X-Gainer is a blend of the highest quality carbohydrates mixed with two types of protein: WPC (Whey Protein Concentrate) and micellar casein. The product was enriched with post-workout recovery boosting agents: beta-alanine and L-glutamine. Set of carbohydrates of various absorption time (ground oats and modified cornstarch/waxy maize plus small amounts of dextrose) guarantee gradual and even energy production. 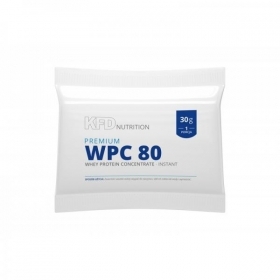 Whey Protein Concentrate (WPC 80) characterises with pure structure of high branched-chain amino acid (BCAA) content; micellar casein releases peptides to the bloodstream gradually. - Great source of various carbohydrates which guarantee gradual and even energy production. - Contains two animal protein fractions of various absorption time. - Improves regeneration processes due to the content of beta-alanine and glutamine. - Provides energy supplies essential for muscle gain; also – perfect meal surrogate. Ingredients: Ground porridge oats, whey protein concentrate (WPC 80), waxy corn starch (waxy maize), dextrose, micellar casein, L-Glutamine, cocoa (for chocolate flavour), Beta-Alanine, flavouring (absent in the natural taste version), acidity regulator - citric acid, salt, sweeteners (absent in the natural taste version) - sucralose and saccharin sodium. INSTRUCTIONS FOR USE: Pour one portion – 100 g (approx. 4 full scoops) into a container with 300 – 500 ml of milk or water and mix thoroughly. Use from 2 to 4 portions daily according to individual needs and immediately after preparation. Not to be consumed by children under the age of 14, pregnant women, people suﬀering from diseases of the kidneys or liver with allergies to lactose, cow’s milk protein or its derivatives. This product contains sweeteners.